- Walk the course without falling off and make sure you are faster than the rabbit. - Take the teleport to continue to the next room. - In the next room you have to find a way down and take the teleport to get the badge. What kind of wonderland is this ... and what kind of cat is that? - To move further you must follow the exact route of the cat. - If you walk the same route and end up in the flowerbed, you will get the badge. The Queen of Hearts wants to see some heads rolling and she is planning to cut off yours.... in which she will succeed if you don't get out of this labyrinth real quickly. - Find the correct teleport that takes you to the green button and the gate will open for you. - Walk to the next gate, but make sure you don't get catched by the chess army. - Answer the question quickly, only the correct answer ensures that you can continue. - Press the green buttons in the correct order to form the heart and to receive the badge! Habbelina has been captured by a frog. She can be saved by fish and birds and need your help to find them. - When you find them, stand close and say "help habbelina"
- If 2 pairs of fish and 2 pairs of butterflies are found, Habbelina will be released. All you have left to do is to use the lever next to the windmill to blow Habbelina down the river. - If she is at the other side, you will receive the badge. Habbelina now lives with the beaver who hates singing mystic birds and he also keeps Habbelina imprisoned. A mystic bird who sang nicely for Habbelina last summer is wounded and lays in the corridor. She wants to secretly help him but needs your help to do so because the beaver can not know! - Enter the house of the beaver and pick up what Habbelina says is necessary for the care of the bird. - If you get close to the item, it will follow you. If you go too far away, it will lose you. - Bring the item to Habbelina, but make sure the beaver doesn't see you. - If all items are brought to Habbelina, the bird will be able to fly away and you will receive the badge. The mystic bird has saved Habbelina and will now try to bring her to the prince so they can live happily ever after. - Make sure the bird reaches the other side, but watch out it, is a difficult air road. There are a number of obstacles that will push you back. - Use the arrow plates to move left, right and forward. 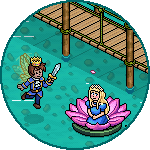 - When you reach the other side, take the teleport to go to the next room to marry the prince and to receive the badge. Snow White has fled into the forest because a hunter is chasing her down He is sent by her evil stepmother who is afraid she is more beautiful than herself. - To save Snow White you have to make sure that you are getting to her before the hunter does. - Use the levers to move forward in the game, but beware, when you handle you have a 50% chance of moving forward, but also a 50% of moving backwards. 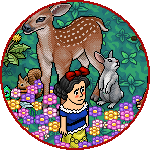 - If you reach Snow White before the hunter does, walk over to her and you will receive the badge. Snow White has been able to flee the hunter and is hiding in a house with 7 dwarfs. But ohhh nooo... the evil stepmother has discovered her and brings a poisonous apple to the house when the dwarfs are working in the mine. - Help the dwarfs to finish their work as quickly as possible so that they can go home and save Snow White. - You have to collect large stones, small stones and a gold bar. - Step on the stones and next to the gold bar to send them to the basket. There is only place in the basket for 1 item at a time. - When there is an item in the basket, step on the color tile of the correct mine cart and then use the lever to load the item. - Some mine carts need multiple items and when an item is properly loaded a light turn on green. - If all the lights are on, use the lever to steer the carts away. The dwarfs have told the prince about the beautiful Snow White. He went looking for her in the forest and will try to wake her up. - Each color tile in the controller is representing a direction. - The color ̈direction ̈ only works if the color tile at the right of the controller shows that color. This color is changing all the time. Little Red Riding Hood is sent by her mother to bring something nice to eat to her sick grandmother. She has to go through a dark forest and there are dangerous wolves. Help her to arrive safe and sound. - Enter your house and find a way to take the basket with goodies. - Watch out for wolves in the forest. If you see one, make sure you stay still when he is looking your way. Oh ooooh .... you ended up in a wolf pack. Hope that turns out fine! 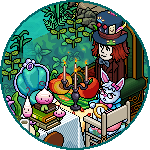 NEW: Teatime in Wonderland Bundle! NUEVO: ¡Lote Hora del Té en el País de las Maravillas! NOVO: Pack Chá no País das Maravilhas! NOUVEAU : Heure du Thé à Wonderland ! NUOVO: Ora del Tè nel Paese delle Meraviglie! NIEUW: Teatime in Wonderland Bundel! YENİ: Harikalar Diyarında Çay Saati Oda Paketi! This particular species of forest chicken can live for 240 years and only turns fully rainbow coloured after its 100th birthday. Radical, rare and never to be sold again - go take a look today! ¡RARO Pollo arcoiris del bosque! RARO Ave Arco-Íris da Floresta! Pollo Arcobaleno della Foresta RARO! Dress like a forest queen. Or a king, of course. Take a look at this rare clothing item before it leaves the Catalogue forever! ¡RARO Guirnalda de Cuento de Hadas del bosque! RARO Coroa Forças da Natureza! Ghirlanda Foresta da Favola RARA! NADİRE Peri Masalı Orman Çelenk Tacı! Get your dose of leisure time while on a visit to a forest full of fairies. 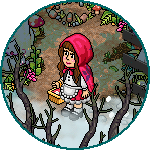 This furni is classified as rare and never to return to Habbo again! ¡RARO Columpio de Cuento de Hadas del bosque! RARO Balanço na Árvore Encantada! Altalena della Foresta da Favola RARA! NADİRE Peri Masalı Orman Salıncağı!